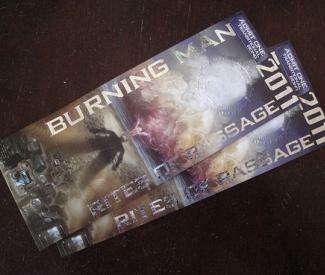 Burning Man attendees are feeling anxious over a new lottery-based ticketing system set up this year to address the growing popularity of the event, so much so that an unprecedented number of them are now registering for pre-sale tickets – which were originally intended as holiday gifts – that are being sold at the top-tier price of $420. Black Rock City LLC, the San Francisco-based company that stages the annual late-summer event in Nevada’s Black Rock Desert, announced the new system last month, setting off a cascade of online denunciations and expressions of anxiety over whether burners will be able to secure enough tickets for their friends, family, and project partners. But she said they needed to try something new after last year’s problems, when strong demand for tickets on the first day of sales repeatedly crashed the online ticketing system, and when the event sold out in late July for the first time in its 25-year history, causing scalpers to sell tickets for double-face-value in many cases. The first round of ticket sales aren’t likely to ease people’s concerns – it could make them more nervous. As in previous years, the LLC is selling 3,000 tickets in December, and their high prices have previously kept demand at around that level. But not this year, as several thousand people have already registered for a lottery-based sale whose registration period ends Dec. 11. “If 10,000 people apply for 3,000 tickets, I’ve got more unhappy people than I want,” Goodell said. Those who don’t get tickets will automatically be registered for the main ticket sale in January, when everyone else will register at either the $240, $320, and/or $390 tiered pricing levels to buy up to two tickets from the 40,000 being sold then (10,000 at the lowest tier and 15,000 each at the next two). Notifications will go out on Feb. 1. Then, in March, about 10,000 more tickets will be sold on a first come, first served basis. Goodell said the exact number of tickets sold then will depend on the permit that is issued by the U.S. Bureau of Land Management for next year’s Burning Man. The LLC has been seeking the negotiate a five-year permit that will allow the event to gradually grow up to 70,000 people. “We’re looking at a five-year permit and the five-year permit has the potential to grow bigger. What that looks like in the first year isn’t clear yet,” Goodell said. There are mixed views in the Burning Man community to growing Black Rock City far beyond its current size of just over 50,000 people. It would open the event to more people, but that presents challenges to acculturation and the logistics of getting people to and from a far-flung locale accessed only by a narrow highway with one lane in each direction. Earlier this year, the LLC moved into a more high-profile headquarters space on mid-Market and set up a nonprofit called the Burning Man Project, which will eventually supplant the LLC in running the event and which is intended to pursue more projects off the playa. Critics last year complained about scalpers reselling Burning Man tickets at high prices, something frowned on in the community and discouraged by the LLC, although it did little to address the problem. An analysis done by the online ticket site Seat Geek found that the average resale price of $350 before the sellout increased to almost $700 afterward, with the highest price ticket going for $1,120. Goodell said that the only way to minimize the scalping of Burning Man tickets would have been to create a system in which all buyers were identified by name and after-market ticket sales were regulated by the organization, “and that’s more than we were willing to do.” Instead, the LLC will be creating an online system for reselling tickets and guarding against counterfeits, with details to be announced later. But she predicted the new system will work better than the old one and that most people’s anxieties are unfounded.